Hydrothermal vents in simple, are openings in the earths’ crust of the ocean floor where extremely high temperatures exits, spewing out chemical water rich with minerals. 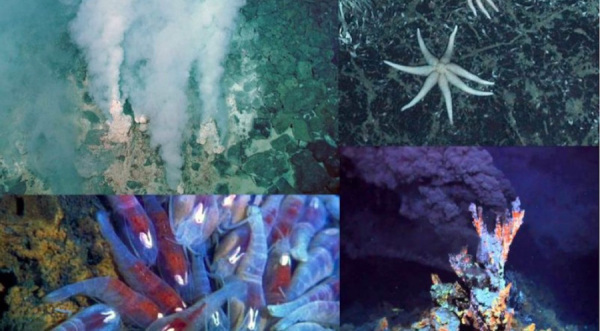 Scientists first discovered hydrothermal vents in 1977 while exploring an oceanic spreading ridge near the Galapagos Islands, and to their surprise, found the area to be teeming with very rare marine biodiversity – large numbers of organisms that had never been seen before. Flourishing with life in total darkness, toxic chemicals, and extreme water pressure where no life thought to exist. It was in the 1980’s that the ocean floors of Papua New Guinea was included as a potential underwater mining site – off the north-eastern waters of PNG, contained highly graded minerals of copper and gold. The project site, ‘Solwara 1’ sits on the sea floor at a water depth of about 1600 meters, containing very high grades of copper and gold – those that are much higher than those from the land. Although there were high costs and engineering challenges that faced the possibility of having the first world under-water mine here in PNG then, there were also questions and concerns raised over the terms of operation and the safety of the ocean against pollution and destruction. Nautilus, the company who will mine the PNG sea floor was granted the Environmental Permit in 2009 with its first mining lease in January 2011. In a recent radio interview with PNG’s Mining Minister, Johnson Tuke, the Minister stated that PNG Government has been open about the project and that Nautilus has released a thorough environmental impact statement. Chief Executive of Nautilus Minerals, Mike Johnston, has stated that is has taken a long time for the project to eventuate and there has always been a lot of support for the project. Nautilus has helped in developments on New Ireland, building toilets and running water to 25 schools, and working with health organisations running vaccination programs. However, the idea of using PNG waters as a lab for testing new technology at this point seem to be an unknown territory that many environmentalists are calling it ‘risky’. “There are too many unknowns and challenges with this operation in our oceans… our marine environment are already stressed by pollution, over fishing and rising sea levels.” stated Johnathan Mesula of Alliance of Solwara Warriors.